The Big Bang Theory hyped its latest episode as a Young Sheldon-type crossover—thanks to the appearance of Sheldon’s childhood best friend Tam—but that wasn’t even best part of the episode. That honor goes to Bernadette and Penny’s mission to befriend Raj’s new fiancé, Anu. To be fair, the Sheldon/Tam/Leonard storyline in “The Tam Turbulence” was classic Big Bang, but it was Melissa Rauch and Kaley Cuoco who stole the episode with their buddy-cop humor and deadpan delivery. It’s that reason why I believe Big Bang could still live on as a spin-off should it choose to; the Bernadette/Penny show more than proved that. But let’s get back to the episode. Penny and Bernadette go on a mission to dig up info on Anu, and in the process exhibit Bachelor-level behavior not endorsed by yours truly (though, TBH, it was hysterical). 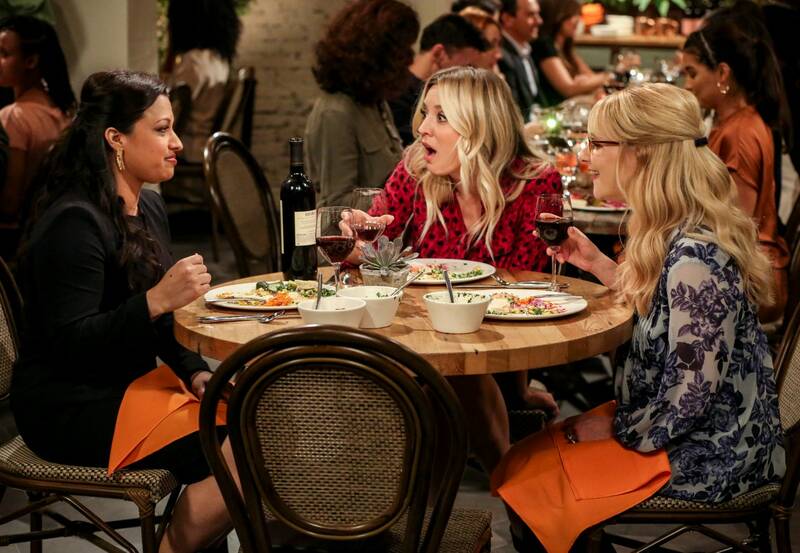 Penny tells Bernadette that she’s “really worried about this Raj getting married thing.” Bernadette agrees. After all, it’s not like they make marriage to their respective spouses look that great. Here’s where they really go off the deep end: Penny suggests that because her deep-dive social media search on Anu has turned up empty, it’s time to call in reinforcements. Bernadette phones her dad—a retired cop—to see if he’ll run a background check on Anu. No, he says. Of course, that’s not good enough for Bernadette and Penny. If he won’t help, they’ll just go to the hotel where Anu is a concierge and do the work themselves. The whole scene that follows (including Bernadette’s story of how she can fit her entire body into her dryer) is brilliant, but if I ever have friends that pull the same shtick on a future boyfriend of mine, please tell me to get new friends. Bernadette and Penny introduce themselves, but Anu is five steps ahead of them, knowing Raj’s friends have just come to get the dirt on her. Doesn’t matter—she’s happy to go along and suggests an ultra-trendy restaurant they all have dinner at later that night. Penny’s impressed; she’s been trying to get into this restaurant forever, to no avail. “Oh, please, getting into impossible places is my super power,” Anu says. And with that, Penny divorces Leonard and marries Anu. Kidding! Penny and Bernadette are still skeptical, saying they both married for love and it turned out…well, fine, they guess. In other words, maybe Anu has a point. Over the course of the evening, Anu turns the tables and gets Bernadette and Penny drunk in hopes of getting gossip out of them about Raj. It works. They spill about Raj’s love of Britney Spears and that he takes baths with his dog…while they both wear swimsuits. Oh, and he snot-cries every time Hugh Jackman sings. Exactly what a girl you just met wants to hear. But he sounds better than half the guys I keep meeting in L.A., so maybe don’t write him off too fast, Anu. Of course, this all gets back to Raj and he is livid—rightfully so. “Do me a favor and stay away from [Anu],” he yells at Penny and Bernadette. They feel bad for a minute before coming to the conclusion that they should do damage control and take Anu out again, especially if they can use her to get them into Soho House. “We owe it to Raj to try,” a sly Bernadette reasons. I can’t wait to see this unfold. Bring it on, Benny.